Declining fish health, fish exhibiting external lesions, incidences of intersex, and death, have been observed recently within the Potomac River basin. The basin receives surface runoff and direct inputs from agricultural, industrial, and other human activities. Two locations on the North Fork of the Shenandoah River were selected for study in an attempt to identify chemicals that may have contributed to the declining fish health. Two passive sampling devices, semipermeable membrane devices (SPMDs) and polar organic chemical integrative samplers (POCIS), were deployed during consecutive two-month periods during the spring and early summer of 2007 to measure select organic contaminants to which fish may have been exposed. This study determined that concentrations of persistent hydrophobic contaminants, such as polycyclic aromatic hydrocarbons (< picograms per liter), legacy pesticides (<10 picograms per liter), and polychlorinated biphenyls (<280 picograms per liter) were low and indicative of a largely agricultural area. Atrazine and simazine were the most commonly detected pesticides. Atrazine concentrations ranged from 68 to 170 nanograms per liter for the March to April study period and 320 to 650 nanograms per liter for the April to June study period. Few chemicals characteristic of wastewater treatment plant effluent or septic tank discharges were identified. In contrast, para-cresol, N,N-diethyltoluamide, and caffeine commonly were detected. Prescription pharmaceuticals including carbamazepine, venlafaxine, and 17α-ethynylestradiol were at low concentrations. Extracts from the passive samplers also were screened for the presence of estrogenic chemicals using the yeast estrogen screen. An estrogenic response was observed in POCIS samples from both sites, whereas SPMD samples exhibited little to no estrogenicity. This indicates that the chemicals producing the estrogenic response have a greater water solubility and are, therefore, less likely to bioaccumulate in fatty tissues of organisms. 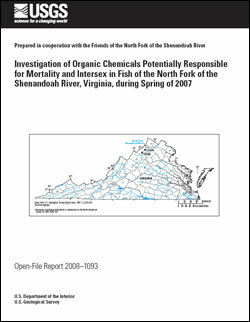 Alvarez, D.A., Cranor, W.L., Perkins, S.D., Schroeder, V.L., Werner, S.L., Furlong, E.T., and Holmes, J., 2008, Investigation of organic chemicals potentially responsible for mortality and intersex in fish of the North Fork of the Shenandoah River, Virginia, during spring of 2007: U.S. Geological Survey Open-File Report 2008–1093, 16 p.
1U.S. Geological Survey, Columbia Environmental Research Center, 4200 New Haven Road, Columbia, Missouri 65201. 2U.S. Geological Survey, Arctic Slope Regional Corporation (ASRC), 4200 New Haven Road, Columbia, Missouri 65201. 3U.S. Geological Survey, National Water Quality Laboratory, Denver, Colorado 80225. 4Friends of the North Fork of the Shenandoah River, P.O. Box 746, Woodstock, Virginia 22664.